93. Application of Transmetallation to the Synthesis of Planar Chiral and Chiral-at-Metal Iridacycles. R. A. Arthurs, D. L. Hughes, P. N. Horton, S. J. Coles and C. J. Richards, Organometallics, 2019, 64, 1099. C. J. Richards, e-EROS Encyclopedia of Reagents for Organic Synthesis 2019 - in press. 91. 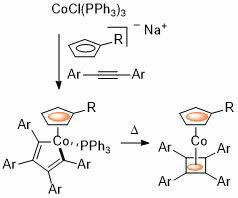 Enantiopure Planar Chiral and Chiral-at-Metal Iridacycles Derived from Bulky Cobalt Sandwich Complexes. R. A. Arthurs, C. C. Prior, D. L. Hughes, V. S. Oganesyan and C. J. Richards, Organometallics, 2018, 37, 4204. 90. Multiple Acetylation of Pentaphenylferrocene. Synthesis and Asymmetric Reduction of 1-Acetyl-1′,2′,3′,4′,5′-penta(para-acetylphenyl)ferrocene. R. A. Arthurs and C. J. Richards Eur. J. Inorg. Chem. 2018, 1655. R. A. Arthurs, P. N. Horton, S. J. Coles and C. J. Richards Chem. Eur. J. 2018, 24, 4310. 88. Synthesis of Diastereomeric Bis(oxazoline) Ligands Derived from (S,S)-1,1′-Bis(4-isopropyloxazolin-2-yl)ferrocene. R. A. Arthurs and C. J. Richards Synlett 2018, 29, 585. 87. Catalyst Optimisation for Asymmetric Synthesis by Ligand Chirality Element Addition – A Perspective on Stereochemical Cooperativity. C. J. Richards and R. A. Arthurs, Chem. Eur. J. 2017, 48, 11460. 86. Deuterium as a Stereochemically Invisible Blocking Group for Chiral Ligand Synthesis. R. A. Arthurs and C. J. Richards, Org. Lett. 2017, 19, 702. 85. 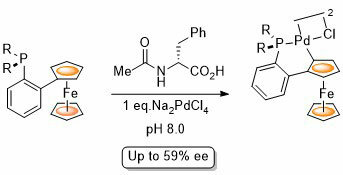 Phenyl vs. Ferrocenyl Cyclometallation Selectivity: Diastereoselective Synthesis of an Enantiopure Iridacycle. R. A. Arthurs, P. N. Horton, S. J. Coles and C. J. Richards, Eur. J. Inorg. Chem. 2017, 229. 84. Metallocene to Metallocene Conversion. Synthesis of an Oxazoline-Substituted Pentamethyliridocenium Cation from a Ferrocenyloxazoline. R. A. Arthurs, P. N. Horton, S. J. Coles and C. J. Richards, Chem. Commun. 2016, 52, 7024-7027. 83. Enantiomerically Pure [2.2]Paracyclophane–4–thiol: A Planar Chiral Sulfur-based Building Block Readily Available by Resolution with an Amino Acid Chiral Auxiliary. A. Vincent, D. Deschamps, T. Martzel, J.-F. Lohier, C. J. Richards, A.-C. Gaumont and S. Perrio, J. Org. Chem. 2016, 81, 3961-3966. 82. 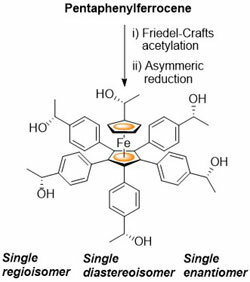 Enantiopure ferrocene-based planar-chiral iridacycles: stereospecific control of iridium-centred chirality. R. A. Arthurs, M. Ismail, C. C. Prior, V. S. Oganesyan, P. N. Horton, S. J. Coles and C. J. Richards, Chem. Eur. J. 2016, 22, 3065-3072. 81. 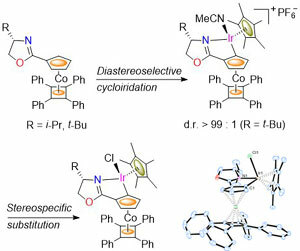 Chirality Control in Planar Chiral Cobalt Oxazoline Palladacycles. 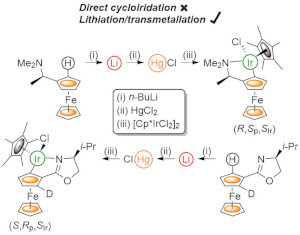 D. J. Cassar, H. Roghzai, D. Villemin, P. N. Horton, S. J. Coles and C. J. Richards, Organometallics 2015, 34, 2953-2961. 80. Application of the Nicholas reaction to the synthesis of dicobalt hexacarbonyl complexed diyne ethers. J. Amin, M. Motevalli and C. J. Richards, J. Organomet. Chem. 2015, 776, 43-50. 79. Synthesis of racemic palladacycles from 2-ferrocenylphenylphosphines. K. Panchal, J. Amin, F. X. Roca, M. Motevalli, P. N. Norton, S. J. Coles and C. J. Richards, J. Organomet. Chem. 2015, 775, 12-19. 78. 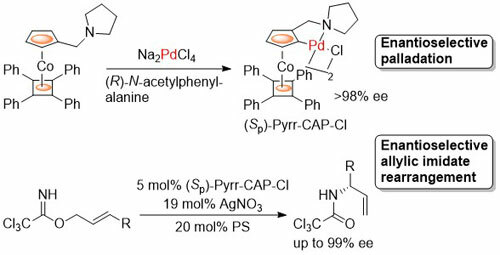 Enantioselective Synthesis and Application to the Allylic Imidate Rearrangement of Amine-Coordinated Palladacycle Catalysts of Cobalt Sandwich Complexes. D. Cassar, E. Nagaradja, D. C. D. Butler, D. Villemin and C. J. Richards, Org. Lett. 2012, 14, 894-897. Jamal Hassan and Christopher J. Richards, Synlett 2012, 23, 239-242. N. Dendele, F. Bisaro, A.-C. Gaumont, S. Perrio and C. J. Richards, Chem. Commun. 2012, 48, 1991-1993. Emin Günay, David. L. Hughes and Christopher J. Richards Organometallics 2011, 30, 3901-3904. J. Spencer, J. Amin, P. Coxhead, J. McGeehan, C. Richards, G. J. Tizzard, S. J. Coles, J. Bingham, J. Hartley, L. Feng, E. Meggers and M. Guille Organometallics 2011, 30, 3177-3181. C. J. Richards, e-EROS Encyclopedia of Reagents for Organic Synthesis 2011. E. Günay and C. J. Richards, Tetrahedron: Asymmetry 2010, 21, 2782. Bergin, D. Hughes and C. J. Richards, Tetrahedron: Asymmetry 2010, 21, 1619-1623. Nomura and C. J. Richards, Chem. Asian J. 2010, 5, 1726-1740.
ed. L.-X. Dai and X.-L. Hou, Wiley-VCH, Weinheim, 2010, ch12, pages 337-368. S. El-fayyoumy, M. H. Todd and C. J. Richards, Beil. J. Org. Chem. 2009, 5, No. 67. E. Günay and C. J. Richards, Organometallics 2009, 28, 5833.-5836. M. Ismail, H. V. Nguyen, G. Ilyashenko, M. Motevalli and C. J. Richards, Tetrahedron Lett. 2009, 50, 6332-6334. H. Nomura and C. J. Richards, Org. Lett. 2009, 11, 2892-2895. H. V. Nguyen, M. R. Yeamine, J. Amin, M. Motevalli and C. J. Richards, J. Organomet. Chem. 2008, 693, 3668-3676. C. J. Richards, e-EROS Encyclopedia of Reagents for Organic Synthesis 2008. R. Yeamine and C. J. Richards, Tetrahedron: Asymmetry 2007, 18, 2613-2616. S. Fossey, M. L. Russell, K. M. A. Malik and C. J. Richards, J. Organomet. Chem. 2007, 692, 4843-4848. C. J. Richards and J. S. Fossey, in The Chemistry of Pincer Type Complexes, ed D. Morales-Morales and C. M. Jensen, Elsevier, Amsterdam, 2007, ch 3, pages 45-78. E. Anderson, L. E. Overman, C. J. Richards, M. P. Watson and N. White. Organic Syntheses 2007, 84, 139-147. E. Anderson, S. F. Kirsch, L. E. Overman, C. J. Richards and M. P. Watson, Organic Syntheses 2007, 84, 148-155. H. V. Nguyen, M. Motevalli and C. J. Richards, Synlett 2007, 725-728. D. C. D. Butler, H. V. Nguyen and C. J. Richards, Org. Lett. 2006, 8, 769-772. M. H. Todd, M. Motevalli, S. El-Fayyoumy, C. Richards, Acta Cryst. 2006, E62, M719-720. C. J. Taylor, M. Motevalli and C. J. Richards, Organometallics 2006, 25, 2891-2902. C. J. Taylor, F. X. Roca and C. J. Richards, Synlett 2005, 2159-2162. F. X. Roca, M. Motevalli and C. J. Richards, J. Am. Chem. Soc. 2005, 127, 2388-2389. R. S. Prasad, C. E. Anderson, C. J. Richards, L. E. Overman, Organometallics 2005, 24, 77. J. S. Fossey, G. Jones, H. V. Nguyen, C. J. Richards, M. A. Stark and H. V. Taylor, Tetrahedron: Asymmetry 2004, 15, 2067. 46. Synthesis and X-ray Crystal Structure Analysis of the First Nickel Bisoxazoline Pincer Complex. J. S. Fossey and C. J. Richards, J. Organmet. Chem. 2004, 689, 3056. G. Jones and C. J. Richards, Tetrahedron: Asymmetry 2004, 15, 653. J. S. Fossey and C. J. Richards, Organometallics 2004, 23, 367. F. X. Roca and C. J. Richards, Chem. Commun. 2003, 3002. J. S. Fossey and C. J. Richards, Tetrahedron Lett. 2003, 44, 8773. L. E. Overman, C. E. Owen, M. M. Pavan and C. J. Richards, Org. Lett. 2003, 5, 1809. T. E. Picket, F. X. Roca and C. J. Richards, J. Org. Chem. 2003, 68, 2592. 39. 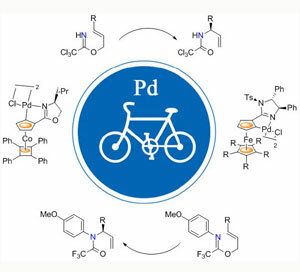 A Direct Route to Platinum NCN-Pincer Complexes Derived From 1,3-bis(imino)benzenes and an Investigation into Their Activity as Catalysts for Carbon-Carbon Bond Formation. J. S. Fossey and C. J. Richards, Organometallics 2002, 21, 5259. D. C. D. Butler and C. J. Richards, Organometallics 2002, 21, 5433. M. S. J. Briggs, J. S. Fossey, C. J. Richards, B. Scott and J Whately, Tetrahedron Lett. 2002, 43, 5169. G. Jones and C. J. Richards, Tetrahedron Lett. 2001, 42, 5553. A. J. Locke, C. Jones and C. J. Richards, J. Organomet. Chem. 2001, 637 – 639, 669. T. E. Pickett and C. J. Richards, Tetrahedron Lett. 2001, 42, 3767. G. Jones and C. J. Richards, Organometallics 2001, 20, 1251. A. J. Locke, T. E. Pickett and C. J. Richards, Synlett 2001, 141. G. Jones, D. C. D. Butler and C. J. Richards, Tetrahedron Lett. 2000, 41, 9351. M. A. Stark, G. Jones and C. J. Richards, Organometallics 2000, 19, 1282-1291. M. J. Bunegar, U. C. Dyer, G. R. Evans, R. P. Hewitt, S. W. Jones, N. Henderson, C. J. Richards, S. Sivaprasad, B. M. Skead, M. A. Stark and E. Teale, Org. Pro. R. & D. 1999, 3, 442. T. E. Pickett and C. J. Richards, Tetrahedron: Asymmetry 1999, 10, 4095. T. E. Pickett and C. J. Richards, Tetrahedron Lett. 1999, 40, 5251. A. J. Locke and C. J. Richards, Organometallics 1999, 18, 3750. A. M. Stevens and C. J. Richards, Organometallics 1999, 18, 1346. R. Salter, T. E. Pickett and C. J. Richards, Tetrahedron: Asymmetry 1998, 9, 4239. C. J. Richards and A. J. Locke, Tetrahedron: Asymmetry 1998, 9, 2377. A. J. Locke, C. J. Richards, D. E. Hibbs and M. B. Hursthouse, Tetrahedron: Asymmetry 1997, 8, 3383. 21. A Metallocene Molecular Gear. A. M. Stevens and C. J. Richards, Tetrahedron Lett. 1997, 38, 7805. M. A. Stark and C. J. Richards, Patent application 9709342.1, May 1997. M. A. Stark and C. J. Richards, Tetrahedron Lett. 1997, 38, 5881. C. J. Richards in Transition Metals in Organic Synthesis, A Practical Approach, Ed. : S. E. Gibson, Oxford University Press, 1997, pp 65-97. A. J. Locke and C. J. Richards, Tetrahedron Lett. 1996, 37, 7861. C. J. Richards and A. W. Mulvaney, Tetrahedron: Asymmetry 1996, 7, 1419. A. J. Locke, N. Gouti, C. J. Richards, D. E. Hibbs and M. B. Hursthouse, Tetrahedron 1996, 52, 1461. C. J. Richards, D. E. Hibbs and M. B. Hursthouse, Tetrahedron Lett. 1995, 36, 3745. C. J. Richards, T. Damalidis, D. E. Hibbs and M. B. Hursthouse, Synlett 1995, 74. C. J. Richards, D. E. Hibbs and M. B. Hursthouse, Tetrahedron Lett. 1994, 35, 4215. D. Sartor, J. Saffrich, G. Helmchen, C. J. Richards and H. Lambert, Tetrahedron: Asymmetry 1991, 2, 639. 10. The Transition Elements. 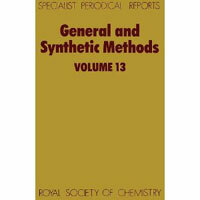 C. J. Richards and S. E. Thomas in General and Synthetic Methods Volume 13, Ed. : G. Pattenden, 1992, pp 250-284. L. Hill, C. J. Richards, S. P. Saberi and S. E. Thomas, Pure Appl. Chem. 1992, 64, 371. C. J. Richards and S. E. Thomas, Tetrahedron: Asymmetry 1992, 3, 143. N. W. Alcock, C. J. Richards and S. E. Thomas, Acta Cryst. 1991, C47, 1261. N. W. Alcock, C. J. Richards and S. E. Thomas, Organometallics 1991, 10, 231. L. Hill, C. J. Richards and S. E. Thomas, Pure Appl. Chem. 1990, 62, 2057. N. W. Alcock, G. A. Pike, C. J. Richards and S. E. Thomas, Tetrahedron: Asymmetry 1990, 1, 531. L. Hill, C. J. Richards and S. E. Thomas, J. Chem. Soc., Chem. Commun. 1990, 1085. C. J. Richards and S. E. Thomas, J. Chem. Soc., Chem. Commun. 1990, 307. N. W. Alcock, T. N. Danks, C. J. Richards and S. E. Thomas, J. Chem. Soc., Chem. Commun. 1989, 21.